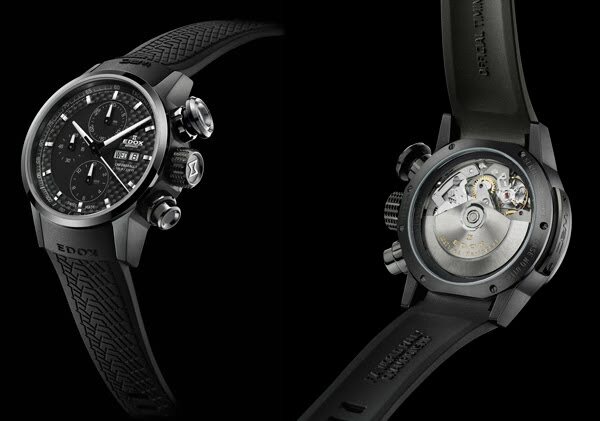 The WRC collection is now augmented by a new arrival, the Chronorally Automatic Chronograph. Actuated by the famous Valjoux, the real V6 engine of horlogerie, sports performance and technicity can be taken as read. The black PVD coating reinforces the piece’s masculinity, while the black carbon fibre dial highlighted with silver fillets offers a further touch of class. The silvered tachymeter scale provides the watch with an extra functionality. Designed for drivers and all car and motor sport enthusiasts, the Chronorally Automatic Chronograph offers all the usual features of the collection with the profiled rubber strap and the signature oversize push-button in eloxed aluminium. The automatic movement can still be admired thanks to the transparent back, surrounded by a black aluminium ring. The 42mm diameter is ideal for all wrists and the guaranteed 100-metre water resistance makes the new Chronorally Automatic Chronograph the perfect partner for all motor or water sports. Edox is the official timekeeper of the the FIA World Rally Championship, the Class 1 World Powerboat Championship and the Dakar Rally.